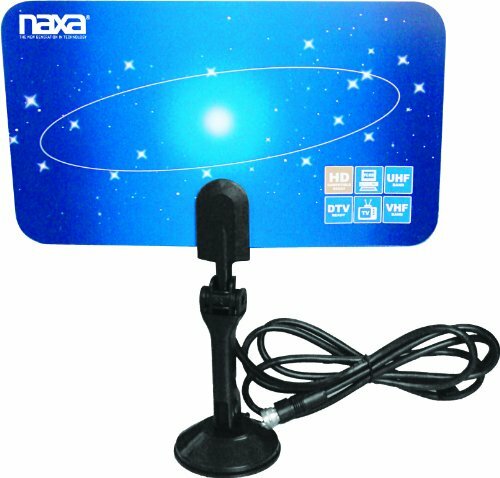 The NAXA NAA-306 Ultra-Thin Flat Panel Style High Powered Antenna Suitable for HDTV and ATSC Digital Television comes with an adjustable stand and is high powered to fit in any location you need. Naxa's mission is to develop the finest quality consumer electronics products that embrace the latest technological innovations guaranteed to provide consumers years of personal entertainment pleasure. These contemporary and ergonomic product designs are created to blend in with any room design or work environment, be displayed with pride of ownership, and to cater to all tastes. Naxa is focused on creating unique specialized products that can meet the requirements of any market segment that may be outside the standard channels of consumer electronics distribution. Naxa Electronics, Inc. is a leader in manufacturing high quality consumer electronics. Naxa offers one of the most comprehensive consumer audio and video electronics product lines possible. In fact, Naxa's current line of products include: personal CD players, portable CD stereos, MP3 players, MP3 CD players, DVD players, VCD players, Televisions, portable stereos, personal portable stereos, portable cassette recorders, AM/FM radios, and short wave multi band radios. Naxa has built its reputation by providing excellent product quality, reliability and value pricing. Their success is based on a relentless effort towards providing our customers with the newest technologies and product designs in innovative product packaging. Naxa takes pride in exceeding customers' expectations by providing quality products.